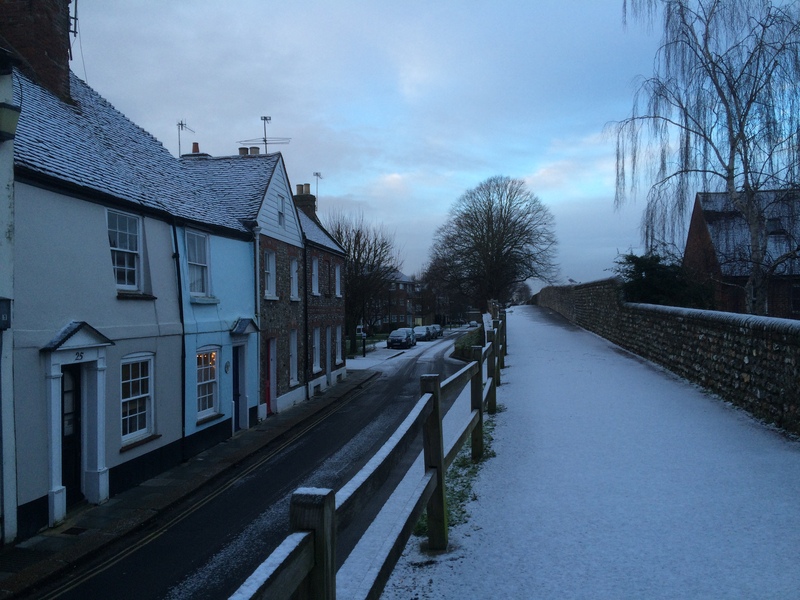 Hello from snow blanketed Chichester! We had hoped to see snow while here and we got what we wanted. It was a very light dusting and occurred over night, but it was nonetheless very exciting to wake up to the beautiful white blanket outside this morning. It is Saturday, so Mostyn did not have to ride his bike to school today, though he fancies trying it at least once. We are both amazed at how much we have acclimated to the chillier temps here, and often remark that it doesn’t feel that cold out, though it is literally freezing, at or below 0. 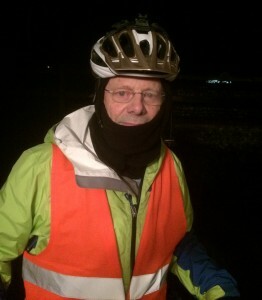 Mostyn in his cold weather riding gear. Mostyn is knee deep in his school work. Next week he receives his first official grade and is spending every night and weekend compiling his work for evaluation. Thus you have to hear from me again this month, as he is far too busy to write for the blog. Maybe next month he will be able to describe all the projects he his busy with and interesting things he is fabricating from scratch and what they do. It is all far too complicated and precise for me to even begin to explain! So keep checking back and one day he will surprise you with photos and details of his work. I will say, his enthusiasm for clocks, conservation and restoration has not waned and he comes home every day expressing how much he loves what he is doing. I have no doubt he will receive a good report and will continue to be as diligent as he has already been. We did have his tutor for dinner last week and had a good discussion about how to make West Dean more accessible for out of country married students. Not many people will go to the lengths and expense we did to get here, so the process needs to be simplified and made more inviting, he agreed. There are solutions, but it is complicated with aspects that involve the British Home Office and academic standards, making it slow going for quick change. It is a very worthwhile endeavor to be here and not just for Mostyn’s acquisition of a Master’s degree, but for the experience that we both have of immersing ourselves in the life of this lovely English town. Chichester is small enough that I recognize folks on the street and they recognize me. More than once I have heard my name called out when in town and am stopped by a friend I have made at a Women’s group or church, or Knit and Natter (a weekly gathering at the city library). Becoming known is such a welcome feeling and allows one to feel very much at home, though not at home! 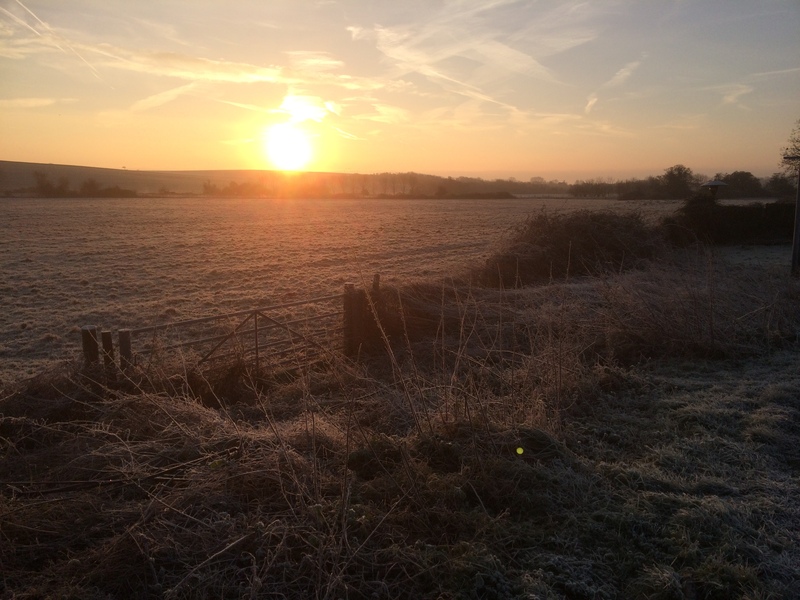 I am having trouble now distinguishing between where home really is, as life here has settled into very much a routine that is familiar and satisfying. I am no longer anxious using the car, though it is often not necessary as most things are available just around the corner from us. I have needed to pick Mostyn from school on several occasions at night, which is a little more difficult, but I have mastered it and feel confident enough to not hesitate if that becomes necessary. 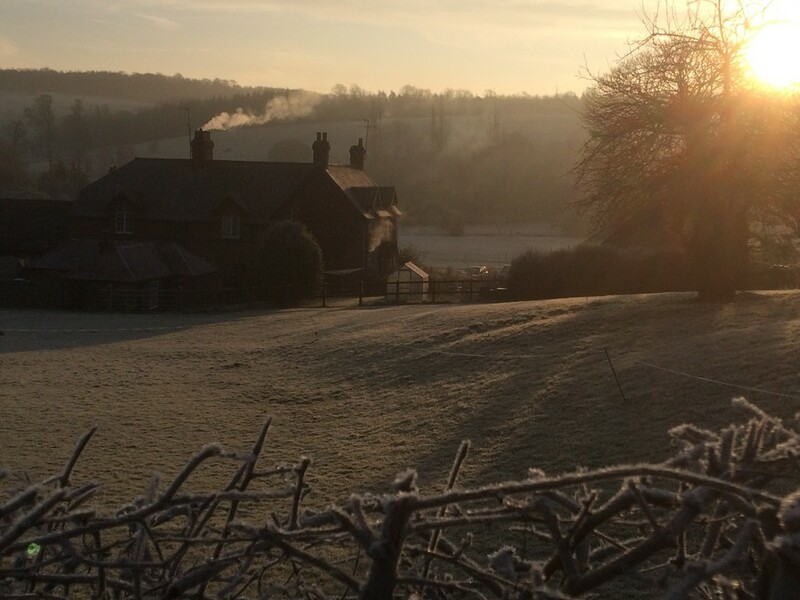 Early frost on West Dean village. We have made travel plans to Vienna in April to visit with Mostyn’s brother and family. We are looking forward to that as Vienna will be a new explore for us and we have not seen Norm and Donna for a long time. Also in April we have made travel plans to Spain, we plan to spend some time on the beach and a visit with the Pringle family, our nephew and niece and family living in Malaga. So though we have acclimated to the cold we do look forward to the warmth of the Mediterranean, reminiscent of our first two married years in Crete. The half-way point on the bike ride to school. So where did January go? Hard to say, but it sure went fast and we have already begun to discuss what’s next, when will we be traveling back, what car to buy, how to keep things simple, and what Mexican food will we eat first as soon as we arrive! Lovely, Debbie. Thanks for writing. Love hearing from you and you are missed here but sounds like an experience of a lifetime!